Jake Mackey | NFL News, as it happens, when it happens. Your one stop shop. Last week Jimmy Garoppolo was average at best against the New Orleans Saints. The numbers do not say so, but his pocket presence and his lack of confidence gleamed through the television set. Holding onto the football, scrambling backwards for negative yards, and throwing across his body to Saints defenders summed up the first week of the preseason for the Patriots starting quarterback for the first quarter of the season. Week two was a completely different story. Jimmy went 16 for 21, for 181 yards, and a nice 16-yard touchdown pass to tight end AJ Derby right before the break. He certainly was not perfect and Josh McDaniels really did not test his arm at all, opting to run most of the time. However, he responded when he needed to and that is what you need to be starting quarterback in the National Football League. The Patriots went down 11-0 early. That could very well be a situation that Garoppolo could be in the first few weeks a handful of times. The offense had a turnover inside the five-yard line after Brandon Bolden fumbled. Nevertheless, Jimmy G responded leading the team on two straight scoring drives. He did not air it out too much, but he made the throws he had to make and he did not put the ball in harms way, and that is all he needs to do in the first four week of this season, which is why in Jimmy Garoppolo terms he was perfect against Chicago. Patriots fans are so use to their quarterback carrying the team for the majority of the past 15-seasons. In the years of 2009-2013, Brady really carried the entire team due to the fact that the talent around him was average. Since 2014 the Patriots players 1 to 53 probably have the most talent in the league, and all Jimmy Garoppolo has to do is lean on those guys and not mess up. That is precisely what he did Thursday night and that was without Rob Gronkowski, Julian Edelman, Danny Amendola, and Dion Lewis. The one thing I need to see more from Jimmy Garoppolo is his arm. The Patriots had a first and goal situation in the first half against Chicago, and Josh McDaniels opted to run three straight times. I understand that establishing some type of running game in the first four weeks will be important, but you have to air it out at least once from that part of the field. He ceratinyl allowed Jacoby Brissett to air it out later in the game, which makes little to no sense. Side note; once again Jacoby Brissett impressed when the lights came on, proving to be the opposite of what the Patriots beat writers say he is on the practice field. Sounds like 2014 Jimmy Garoppolo all over again, except Brissett is getting zero positive attention from the media. Like I stated earlier, Jimmy Garoppolo does not have to be Tom Brady perfect, he just has to be Jimmy Garoppolo perfect which is what he was on Thursday night. Since last Wednesday when NFL free agency, “officially” started, a large majority of Patriots fans have been progressively losing their collective minds. “Why didn’t they get Forte! They need a deep threat! Why isn’t Bill doing anything, I hate that their so cheap they never sign talent!” Those are just some of the statements that have been floated around Patriots Nation over the past half-week, and it truly has become a yearly event during the Bill Belichick era. Patriots fans should take a page out of Aaron Rodger’s playbook on this one and just, “RELAX”. Not very often does Bill Belichick open up the checkbook and start signing players left and right during free agency like the Miami Dolphins or the Jacksonville Jaguars. Spending big time in free agency isn’t always a good thing. You can look like the Super Bowl champions in March, but then when actual games are played teams start to realize that they have left themselves flawed in other positions. ESPN stats and information tweeted out a graphic last week in which they showed the teams that have spent the most money over the past ten years. The Miami Dolphins topped the list at 629 million dollars spent over the past ten years, and in those ten years they have only made the playoffs once. Miami was followed in the top six by teams such as Jacksonville, Philadelphia, Washington, Tampa Bay, and Cleveland. Even in years when the Patriots have, “spent big” they have still signed players to team friendly deals. Randy Moss was acquired via trade and was basically on a one-year deal, and in 2014 Darrelle Revis was signed also to virtually a one-year contract friendly to the team. They don’t spend, plain and simple and they continuously are in the AFC Championship. The crazy thing about Patriots fans clambering for moves right now is that a month ago when the season ended, fans were pretty content with the roster. The only important player that had a contract that was up is Akiem Hicks (signed with Chicago). The defense is young, and besides a solid second corner there really aren’t any positions of need on that side of the ball. On offense, the offensive line could use some depth but that wasn’t expected to be addressed in free agency, but more than likely in the draft. A running back and wide receiver were needed. The team addressed the wide receiver spot with Chris Hogan out of Buffalo. As a Patriots fan I am content with that signing. I understand that Marvin Jones and Mohammed Sanu are more flashy names that would have been better additions, but for the money they received it wouldn’t have been logically to pay them that highly to be a third option. Chris Hogan is more than capable of doing what Brandon LaFell did in 2014, and that is all the team needs him to do. At running back I can understand the frustration because they so desperately need a back who can consistently carry the ball. Matt Forte however didn’t seem to be a fit. Sure he can run the ball, but he is more known as a pass catching back, and the Patriots already have their fair share of those with Dion Lewis and James White. Many don’t think Dion Lewis will come back and be the same player, and I find that to be a bit ludicrous. ACL tears are not as serious as they once were. We have seen the likes of Adrian Peterson and Rob Gronkowski come back and be very productive the following seasons. I am setting the bar high for Lewis coming back. Again, the draft may be a better option for running back. Derrick Henry is the name that has been floated around the most. He is a big, “bell cow back” that can be developed and be exactly what they need. Just brining back LeGarrette Blount is not the answer. The Patriots right now as currently constituted still makes them the best team in the AFC, especially with Martavis Bryant of Pittsburgh being suspended for all of next season. The Patriots defense is getting to the point where they are almost on par with the Patriots offense, which could make them dangerous. Therefore, staying put may not have been the worst thing through the first wave of free agency. Q: So we are a few days removed here from the combine where you impressed. You placed first among defensive backs in the three-cone drill. How do you feel you handle the whirlwind that is the NFL Combine? A: I thought the combine went well and that I handled everything pretty well. A lot was thrown at us but it was a great experience to go through. A couple of my times were a bit slower than when I had trained, so I am going to focus on improving those times. Q: Draft prospects train so hard and long for the combine, and it is mostly drills that a lot of fans and media feel aren’t all that relevant in determining a football player’s talent. Do you feel as if you benefit in training for drills like the three-cone, broad jump, and the 40-yard dash? A: Training for the combine is definitely different from regular football training. When you train in regular football training and you get an injury, you try and fight through it. You put it all on the line. When you train for the combine, and you get a bump or bruise you focus more on healing. You have to make sure you are at full strength. Drills like the three-cone are real helpful especially as a defensive back because it is so focused on cutting and turning your hips. Q: Now that the combine has passed what is your focus on now? Pro Day? A: Yeah definitely, all about the pro day. I mainly want to focus on my position drills for my pro day. I want to make sure I show my fluidity in my hips and things like that. Q: When someone watches your tape they quickly realize that you’re a, “ball hawk.” Anytime the ball is in the air your always in the area. Is that your main goal as a defensive back to always be around the ball? A: Yeah anytime your out there on defense your trying to make a big play. If your team or teammate doesn’t seem up, you want to try and bring a big play to get everyone into it. Anytime you can do that it’s huge for a defense. Q: A lot of coaches and scouts look for versatility in a defensive back at the pro level? Do you think you can provide that? A: Yeah throughout my time at Boston College I played all around. I played strong, free, and down in the nickel position. Any way I can help my team I am willing to do it. Q: You played with guys at Boston College who are in the NFL now, and you are going through this draft process with guys who are hoping to make it with you. Do you lean on each other and have you reached out to any of the guys now in the league? A: Yeah we all lean on each other, we are all working out together and trying to make each other better players. Guys like Connor (Wujciak), and Steve (Daniels), we are all pushing to make each other better. 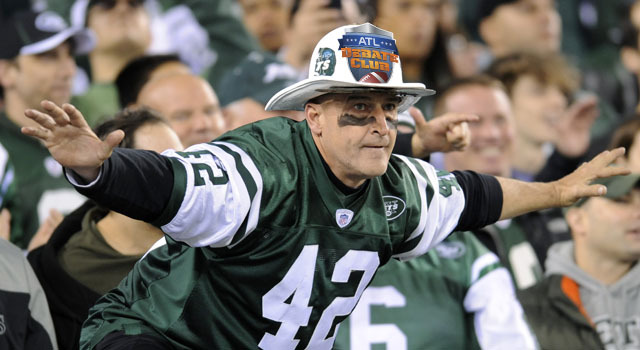 Guys in the league are always there for us, you know Andre Williams, guys like that are always there when you need them. Q: Last question here, when an NFL team drafts Justin Simmons, what will they be getting? A: Definitely a guy with high character, high effort, who loves the game of football. I always love to be prepared. I never want to be out on the field if I don’t know what to expect. I study the ins and outs of the game. I am always prepared, and try to be in the right place at the right time. Also, I like to think I am a very tough individual, and I am an extremely competitive person. I always have thought of myself as an underdog, and I like to carry myself with that chip on my shoulder. At 6-3, 202 pounds, Justin Simmons has the build and without a doubt the athleticism to be a top-notch NFL defensive back. After speaking with him I also learned that he also carries himself as a true professional who is training and ready to take the next step. As a Patriots fan, the last significant loss I have had to deal with was November 30th, 2014 when the Patriots just fell short to the Aaron Rodgers led Packers in Green Bay. A full year later Patriots fans woke up on a Monday morning in unfamiliar circumstances. Their team lost a heartbreaker to the Denver Broncos in overtime, in a game where almost every significant player for the Patriots except for Tom Brady was injured at some point. The Patriots still managed to out play Denver for the vast majority of the game, but their biggest mistake came in the fourth quarter once Chris Harper fumbled a punt, putting Denver back in the game. What made things ultimately worse was the fact that the Patriots allowed the referees to play a role in the outcome of the game. In the first three quarters of the game, the Patriots only had one penalty called against them, and that was an obvious face mask call on Tavon Wilson in the third quarter. They finished the game with five total penalties, four coming in the fourth quarter. The first significant call of the fourth quarter came in the drive right after Denver narrowed the score to 21-14. The Patriots were faced with a third and eleven play, but Tom Brady scrambled and found Keshawn Martin 51 yards down field. The play was called back however because of a holding call on Tre’ Jackson. It was without a doubt a hold, but Patriots fans gripe with the call is due to the fact that the officials were not calling it both ways. For example, on CJ Anderson’s 48-yard walk off touchdown Devin McCourty was blatantly held in the backfield. That would have made it third down and eleven from the Denver’s own 41 in sudden death over time. I would have liked the Patriots chances in that situation. The old adage in football is that you can call holding on every play, but if your going to go all in with holding calls make sure it’s a two-way street. The next egregious penalty came while the Patriots had the ball up by four points with just over five minutes left to play. On a third and five play Brady hit Gronkowski for a ten-yard gain. Nevertheless, it was called back for offensive pass interference on Gronkowski. This was the tenth offensive pass interference called on the Patriots this season. That is first in the league, and the teams tied for second only have five calls against them. It is evident that opposing teams and officials are focusing squarely on a player such as Gronkowski because of his size, and he cannot get away with anything close to offensive interference. Without a doubt, the worst call in this game and arguably the season so far came on the Broncos final possession of regulation. Denver drove the ball down the field and had it second and goal at the seven-yard line. That is when Alan Branch came up with the huge play bursting through the line and taking down Brock Osweiler for a loss of twelve yards, seemingly putting the Broncos is a third and nineteen situation. However, yet again the referees got in the way calling a, “ticky-tack” to say the least, holding call on Patrick Chung in the end zone on Demaryius Thomas, where Thomas clearly grabbed Chung’s face mask. The worst part is Brock didn’t even look in that direction and the ball wasn’t in the air. That call cost the Patriots the game. If it were third and goal from the 19, I would take the Patriots to hold Denver twice there. After that they would only need to take a knee and they would be on to 11-0. Now, personally I have never been the person to blame officials for Patriots losses. I can’t think of a game where they truly out played their opponent and the were just beaten by the zebras. This game this past Sunday has made the best case thus far. Sure, the Patriots didn’t capitalize. There was questionable play calling down the stretch, Patrick Chung dropping an interception, and of course Chris Harper muffing the punt (he has since been released). They didn’t make some of the plays they could’ve made to win the game. This refereeing issue does need to be solved. I’m sorry to all you Roger Goodell hating, conspiracy theorists Patriots fans, but this isn’t a result of the league having it out for the Patriots, it is just a league wide issue. What the commissioner should do is start having his zebras be held accountable like a player would be if they were to make a mistake. Until he does that, nothing will change and unfortunately the tipping point for officials would have to come in the playoffs when generally flags aren’t called. Until then playoff seeding’s and potential spots in the tournament will continue to be in jeopardy large in part due to the officials. It is one thing that fans of all team can come together on. 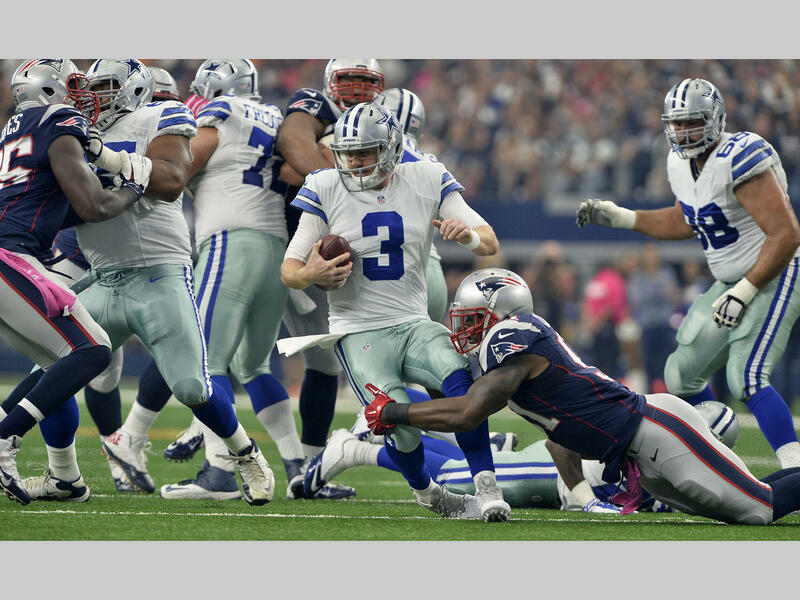 The New England Patriots continued their undefeated season on Sunday when they rolled over the Dallas Cowboys 30-6, lead by a ferocious second half run. Using the NFL Game Pass coaches film application, I was able to re-watch the game and break down the, “All 22” and get a better glimpse of each players performance. Here are three studs and duds from my film evaluations. Jamie Collins: Through the first few games of the season, Jamie Collins was very unimpressive. He was slow to the ball in the run game, and was sucked up by offensive lineman on multiple occasions. This past Sunday, Collins was all over the field. He was constantly in the backfield and all over the check downs that Brandon Weeden was dishing out. On one play in the first half that was called back on a defensive holding call on Jabaal Sheard, Jamie Collins just barreled through Darren McFaden for the sack in under two seconds. 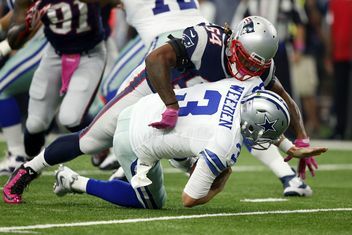 His coverage was also very good as he and Devin McCourty blanketed Jason Witten, who had a very quiet afternoon. Dion Lewis: Without a doubt, the biggest surprise of the Patriots season thus far has been Dion Lewis, and that was never more evident than on Sunday. He finished the game with eight receptions, for fifty-nine yards, and one touchdown. He did have trouble pass blocking in the game which has been his only flaw thus far, but his ability to come out of the backfield and and get yards after the catch, is unreal. The most obvious example of this was on Sunday, when Lewis made a one handed grab inside the red zone and proceeded to make five defenders miss on his way to the end zone. Also, the biggest play of the game came late in the second quarter on third and one, with the game tied at three. Lewis was wrapped up by his leg in the backfield, broke off the tackle and scurried down to the one-yard line. Malcolm Butler: On Sunday, Malcolm Butler shadowed his side of the field giving up very little yardage. On many different occasions, Butler got his hand on passes intended for Terrence Williams. Also, he is continuing to come up on run plays and show his physicality. By far, Sunday was his best performance, even though it was against a very sub par quarterback with average wide receivers. This week will be more of a test. LeGarrette Blount: Without a doubt, Dion Lewis has taken over the number one running back role. It has much to do with Blount’s ineptitude and Lewis’s performance. On Sunday LeGarrette Blount had a solid game on paper, but from just watching the game it was obvious that he did not perform all that well. On two separate plays, Blount had the chance to convert a first down on short yardage situations. He failed on both. For such a big back, he should be able to use his size to power through, however he tries to run like a Dion Lewis type of back. David Andrews: After a hot start, David Andrews has slowed down over the past couple of weeks. On Sunday there was not many bad performances, but Andrews had a less than stellar day. The Patriots were virtually never able to run the ball through the interior. Even though Blount is much to blame for not converting on short yardage situations, Andrews played a big part as well. Again, not an awful day for Andrews, but he could use some improvement. Patriots Offensive Tackles: The worst group on the Patriots by far came from the offensive tackles. Particularly, Nate Solder who left with injury, Marcus Cannon, and Sebastian Vollmer. Throughout the week heading into the game, everyone talked about how can Dallas get to Brady. The general consensus was that they would have to go through the interior. Wrong, all of the pressure the Cowboys created came from the edges. Greg Hardy absolutely destroyed and overpowered Nate Solder early on sacking Brady, and also getting hits on him after he got rid of the ball. Vollmer and Cannon were also just overpowered on different plays and it lead to Brady being sacked five times. It was their worst performance of the year, and they can’t expect to play like that against teams such as the Jets and the Broncos and expect to win and keep Tom Brady healthy.